The International Covenant on Civil and Political Rights (ICCPR) guarantees to every citizen the right and the opportunity to be elected at periodic elections to ensure the free expression of the will of the electors (Article 25). Sri Lanka, as a party to this Convention has an obligation under Article 2 of the ICCPR to ensure that all individuals within its territory and subject to its jurisdiction are granted the rights recognized in the Convention. Then it is the Constitution which has granted authority to Parliament to enact a statute. Therefore, any Act of Parliament cannot legally deny any person the fundamental freedoms granted by the Constitution including the freedoms referred to in Article 25 of the ICCPR. Sarath Fonseka was brought before the Court Martial on the charge that he had taken part in politics while serving in the Army. During the relevant stage of his career he was the Chief of Defence Staff appointed under the Chief of Defence Staff Act No. 35 of 2009. This law is peculiar to the holder of the office. When Parliament passed this law last year, we did not impose any restrictions on the operation and the exercise of the fundamental rights contained in Chapter 3. Thus the fundamental law of our country ensures that the fundamental rights referred to above are applicable in the case of the Chief of Defence Staff. In such a situation there cannot be a penalty imposed on him for determining his career after his retirement. Many public officers have contemplated entering politics after retirement; in fact, some of them have retired from service prematurely to contest at elections. Nor is a military officer or a public officer precluded from talking of his / her future employment intentions before retirement. What is the difference between contemplating on starting a business and contemplating on entering politics after retirement? Can we deny him the freedom of thought enshrined in Article 10 of the Constitution? Both the Prosecuting Counsel and the Judge Advocate General at the Court Martial of Sarath Fonseka failed to mention that the CDS Act should be read together with the Constitutional Rights enshrined in the Constitution. 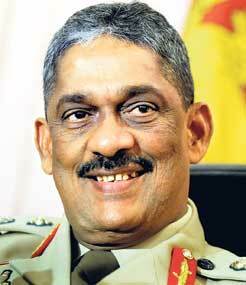 General Sarath Fonseka applied to retire from the Army on November 12 2009. His request was granted by President Rajapaksa with effect from November 14 2009. On November 19, 2009, after his retirement, I informed the Working Committee of the UNP that since the Government had not made an announcement regarding a Presidential or a Parliamentary Election, the Party should not rush to make a decision about a presidential candidate. After the announcement of the Presidential Election, the UNP Working Committee met on November 26 and endorsed General Sarath Fonseka as the Common Candidate of the Opposition. By this time similar decisions had been taken by some of the other political parties as well. Since he had retired from the Army, the Military Regulation 13/79 made under the Army Act no longer applied to him. But the Prosecuting Counsel and the Judge Advocate kept this information from the Court Martial and instead stated that the decision to nominate Sarath Fonseka was discussed for three week by the UNP when he was in uniform. I refuted this in Parliament stating that the Prosecuting Counsel had stated a falsehood and that he deliberately misled the Court Martial. General Sarath Fonseka was charged under Section 124 of the Army Act for using “traitorous or disloyal words regarding the President.” The Judge Advocate General referring to “traitorous” or “disloyal” words used in Section 12 did not give the meaning of “treason”. A person cannot be convicted in a Court Martial without defining the offence and the actions which constitute the offence. The Black’s Law Dictionary defines “treason” both under the US and English law. In Cramer vs. the USA the Supreme Court stated that treason consists of two elements: “Adherence to the enemy, and rendering him aid and comfort”. In English law treason is defined as “… adhering to the king’s enemies in his realm, giving to them aid and comfort in the realm or elsewhere…” Since it was alleged that the information was to have been given to the US government, is the US Government then deemed to be an enemy of this country? If so, the Sri Lankan Government must state so. The US Government has on a number of occasions helped us against the LTTE. The words alleged to have been used by Sarath Fonseka cannot be deemed treacherous. The Report “Sri Lanka: Recharting U S Strategy after the War” by the Committee on Foreign Relations United States Senate referring to a discussion with Gotabaya Rajapaksa, Secretary ministry of Defence, states “he did not deny there have been cases of government abuse but that defeating the LTTE had been the top priority and trumped other considerations”. Civil and Military officials in USA, UK and other countries have from time to time divulged that some members of their armed forces have abused human rights in times of war. This does not constitute treason. On the other hand, none of the reports issued by the US State Departments and Congress refer to any statements made by Sarath Fonseka against the Sri Lankan Government. Moreover, during his stay in Washington DC, General Fonseka was accompanied by Embassy officials. There is no evidence of General Sarath Fonseka having made a statement regarding the war to the US Government. Neither did the Prosecuting Counsel show that the US Government was planning to prosecute the President and the Secretary Ministry of Defence or put them in any other difficulty. But, the Sri Lanka Ambassador to the US was not called as a witness by the Court Martial. There is no evidence to prove that the words spoken, even if they were true, caused any harm or injury to the President – nor do they come within the definition of traitorous or disloyal. This is because Sri Lanka is not a party to the Rome Statute of the International Criminal Court. I declined to sign it when I was the Prime Minister. As a result no person can be charged with war crimes. Another instance of misleading the Court Martial is the introduction by the Prosecuting Counsel of the Emergency Regulation No. 1100/1 made on 21 July 2001 as evidence (Judicial notice) regarding the composition of the National Security Council. It is correct that these regulations made legal provisions for the National Security Council. However, these Emergency Regulations are no longer valid as all Emergency Regulations lapsed in October 2001 when President Chandrika Kumaratunga did not renew the Emergency. The next time President Kumaratunga proclaimed Emergency was in 2005. The new set of Emergency Regulations which are still in force do not make any reference to the composition of the National Security Council. Thus the 2001 regulations referred to by the Prosecuting Counsel are no longer law. It seems the Judge Advocate referred to invalid regulations in summing up the case. Furthermore, the witnesses giving evidence against Sarath Fonseka had never actually met him. According to the evidence he is alleged to have spoken to witnesses by mobile phone. Some of the witnesses stated that a CDMA phone in the possession of a journalist by the name of Ruwan Weerakoon was utilised to speak to General Fonseka. However, Ruwan Weerakoon was not called as a witness. Neither did the Government utilize all the investigative and technical resources at its disposal to lead expert evidence to establish that these telephone calls were made on telephones that could be traced to General Fonseka. The Court Martial found Sarath Fonseka guilty on evidence that would not have sufficed to convict a person in any Court of Law or an institution administering justice. The principal object of a Court Martial is not so much the administration of justice but the maintenance of discipline in the Army. It is based on the royal prerogative to regulate and discipline the Army exercised by Edward I in 1279. The CRS Report for the US Congress titled “Military Courts-Martial : An Overview” by Estela I V Pollack (Order Code RS 21850) states “Military Courts are not considered Article III (US Constitution) courts but instead are established to Article I of the Constitution”. Anyone who is even vaguely familiar with the US Constitution will know that Article I deals with the Legislative Branch of the Government in the US, while it is Article III that deals with the Judicial Branch of Government. By stating that Military Courts are not Article III Courts (or Courts of the judicial branch) is to exclude them from the category of Courts of Justice. A Court Martial is thus a special Military Tribunal created for a very limited purpose. In the US this provision was first made under the Articles of War and not the Articles of the Constitution. In other words, a Court Martial is not a “Judicial” Court but a “Legislative” Tribunal. So much so that in the US persons convicted by Courts Martial did not have a direct appeal to the nation’s highest court, the Supreme Court, and it was only in 1984 the Congress gave service members limited access to the Supreme Court. This is not different to the Constitutional arrangement found in Sri Lanka. At the time of Independence Sri Lanka did not have an Army. We had the Ceylon Defence Force established under the Defence Force Ordinance. The Parliament acting under its powers to raise and maintain Armed forces enacted the Army Act to establish the Sri Lanka Army in 1949. The Army Act makes provision to make regulations relating to all matters concerned with the establishment and sittings of a Court Martial and to court martial army personnel in order to maintain military discipline. Courts of law and other institutions administering justice are established by Acts of Parliament and not by regulations subordinate to the Acts of Parliament. Article 170 of the Constitution empowers the Judicial Services Commission to determine the question whether a person is a judicial officer. Members of the Court Martial who are Military officers do not fulfil the requirements of the categories of Judicial Officers referred to in the Constitution. By Section 64 of the Army Act a conviction by a Court Martial has to be confirmed by the President (or such other authority as referred to in the Section). It is a very bizarre procedure, to say the least, when the Executive has to confirm the recommendation of a Court Martial – defeating the separation of powers of the Executive and the Judiciary. The manner in which the judgment of a court is contested is by way of an appeal to a Superior Court. This however is not so in the case of a “judgment” of a Court Martial. There are no Superior Courts to which an appeal can be made. The manner in which the decision of a Court Martial is challenged is by way of a Writ from the Court of Appeal which is the manner in which administrative decisions are challenged. Therefore, a Court Martial is not a regular Court but belongs to the genre of Administrative Tribunals, the principal and perhaps sole purpose of which is the smooth functioning of an organization and the maintenance of discipline rather than the administration of justice. My position is that the entire exercise of the so called court martial of Sarath Fonseka was contrary to the principles of natural justice and contrary to Article 25 of the International Covenant on Civil and Political Rights (ICCPR) which Sri Lanka had ratified as far back as June 11, 1980. It is also a complete violation of the provisions of our own Constitution. The Court Martial recommended that General Sarath Fonseka be stripped of his rank of General and his pension be denied. The pension is the right of compensation of any person who has served the Government. It is a complete travesty of justice for a person to be deprived of his pension for lifelong service to the nation. It will leave that person destitute. It is also against Army practice to remove the rank awarded to an officer for winning a war. This recommendation made by the Court Martial constitutes degrading treatment and punishment which is prohibited by Article 11 of the Constitution of Sri Lanka. The case against General Fonseka can be described as exceedingly feeble. No Court of Law would have ever held against him on the evidence presented and the submissions made to the Court Martial. Furthermore, to make findings against a Member of Parliament without substantial evidence and to deprive him of his pension rights and his rank without a basis amount to a breach of privileges of Parliament. This is why I raised a question of privilege in Parliament and called for the proceedings of the Court Martial to be tabled in Parliament. Sarath Fonseka was promoted as a General in recognition of his services as Army Commander in defeating the LTTE. The awarding of a higher rank in such an instance is not only a recognition of the Commander, but also of all the men and women who served under him. Therefore, once an officer has been granted a higher rank in recognition of his services it is never removed. The decision to remove the rank of General Sarath Fonseka is an insult to all those brave soldiers.